Visual Studio Extensions for Telerik UI for Silverlight aim to help developers when creating Silverlight Application with Telerik UI for Silverlight. Project creation, conversion and configuration – reference management. Project Upgrade - upgrading Telerik UI for Silverlight to a new version. Common scenario page creation - aid creating pages with basic scenarios in the usage of Telerik UI for Silverlight. Toolbox configuration – select what version of Telerik UI to be populated in the Toolbox. 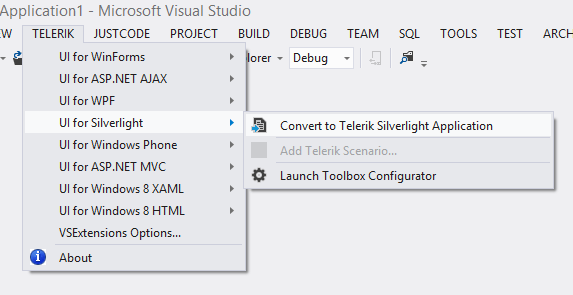 Visual Studio Extensions for Telerik UI for Silverlight are distributed with the Telerik UI for Silverlight installer. They can be downloaded and installed as separate product from the Visual Studio Gallery for Visual Studio 2010 and later. The extensions support Visual Studio 2010 and 2012, handling Silverlight 5 applications. 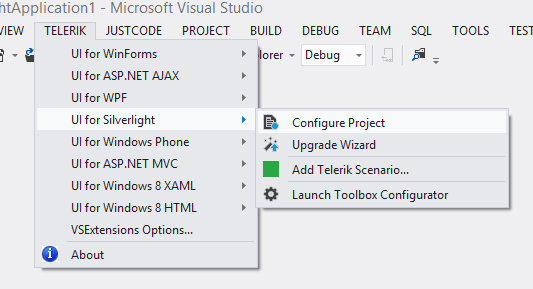 The Visual Studio Extensions can be accessed through the Telerik | Telerik UI for Silverlight menu which has different menu items depending on the selected project in Visual Studio. The extensions can be accessed through the context menu of a Silverlight Application as well. These are available in the language specific nodes of the dialog as well. 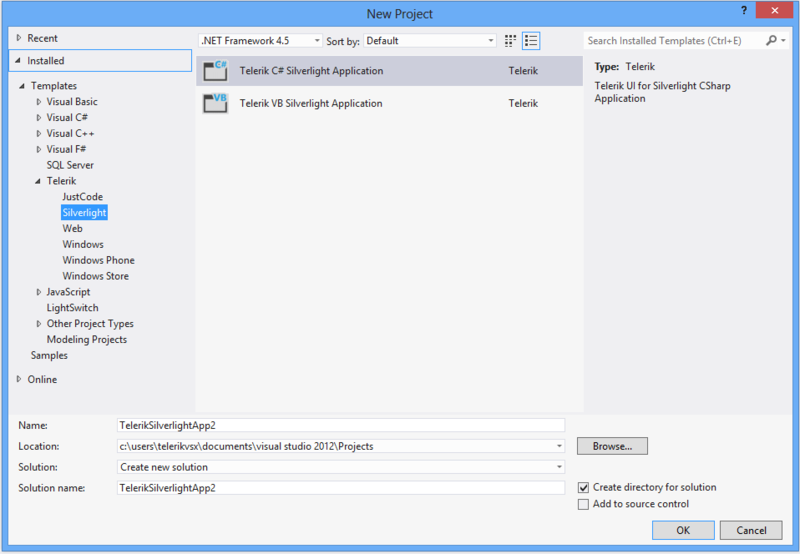 New Project dialog contains Telerik Silverlight Application under both CSharp\Silverlight and Visual Basic\Silverlight nodes.